At a time when consumers appear to increasingly vote with their wallets, either in support of or against companies, Weber Shandwick and KRC Research surveyed consumers in the US and the UK to explore the motivations behind consumer activism. The research, Battle of the Wallets: The Changing Landscape of Consumer Activism, investigates the motivations behind boycotters and those who show support for companies by intentionally buying from them (“BUYcotters”). The research finds that the BUYcott movement is growing and expected to outpace boycotts. Eight in 10 consumer activists in the US and UK (83 percent) agree it is more important than ever to support companies that do the right thing by BUYcotting. Fewer (59 percent) say it is more important than ever to participate in boycotts. BUYcotters have taken more supportive purchase actions in the past two years (5.7, on average) than boycotters have taken in opposition (4.5, on average). BUYcotters are also more likely to take action in the future: 37 percent of BUYcotters expect to take more supportive actions over the next two years versus 28 percent of boycotters who expect to do more boycotts. The primary motivation for BUYcott behavior is to support a company or brand’s reputation, cited by 48 percent of BUYcotters. For boycotters, changing the way a company or brand does business is the top motivator (36 percent), but that is nearly tied with harming the reputation of the boycott target (35 percent). In both boycott and BUYcott cases, wanting to influence sales takes a back seat to impacting reputation. 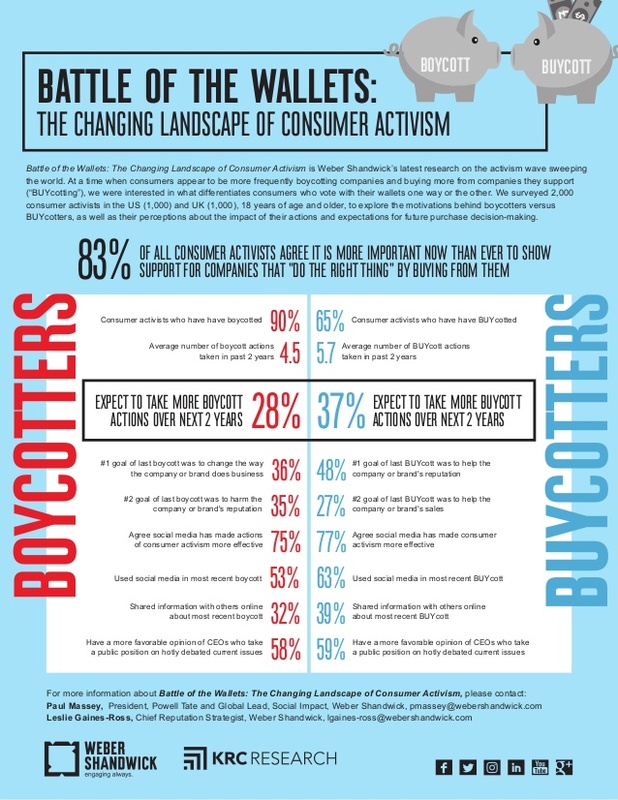 Battle of the Wallets provides six guidelines for companies to navigate the changing landscape of consumer activism and to leverage the growing BUYcott movement. Click here to view the report and view the infographic and slides below.